"And now you want Madness to let you loose with your grubby maulers on our classic, critically acclaimed, mega-selling The Liberty of Norton Folgate?" OK, make that three. One for luck. We discussed how this might work. I would not only need his approval but that of the rest of the band too. And, as luck would have it, The Liberty of Norton Folgate was the perfect concept album to go back with to my producer Jeremy Mortimer. The next stage was to find out what inspired the album. After conversations with Suggs and Carl Smith (aka Chas Smash) I found out. At the heart of it are the positive elements of immigration to London’s Spitalfields. How generations of immigrants have contributed to the area to make it the vibrant, unique place that it undoubtedly is. Norton Folgate itself is a street connecting Bishopsgate with Shoreditch High Street. A few years ago a building - much loved by the community - on Norton Folgate was threatened to be demolished. All looked doomed until it was discovered that Norton Folgate at that time was a "liberty." An independent strip of land falling outside the jurisdiction of the local council. This story inspired the songwriters to think about the multicultural influence that had helped to build the community over generations. Each wave of immigrants, from The Huguenots to the Bangladeshis and the Poles, all contributed to the area with their various skills. At the start of the writing process I would sit in a Turkish café on Norton Folgate. Observing. Taking photographs. Making notes. Talking and listening. Building a story. What evolved was Passport to Pimlico via Romeo and Juliet with a subplot of bigotry. A story woven around the songs on the album. In the play, The Union café is threatened to be demolished. The livelihood of Bangladeshi owners, Gazi and Sitara, is under threat. They fear for the identity of the community. This family make a stand for preserving British culture. The right for all their customers to a full English breakfast. The right not be blanded-out by a corporate tax-evading coffee chain. I ran the idea by the band who approved the story. Some even wanted to be in it! Much to my and Jeremy’s delight. I worked on the plot and the structure of the play. I wrote the script and inserted the songs - listening to how the lyrics and music fitted in with the story. 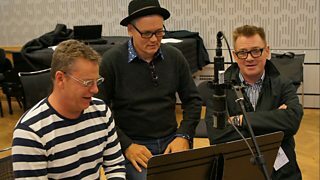 Last November, Jeremy arranged a read-through at Broadcasting House with the radio rep. The songs were played as the play was read, and it was a hoot. My dialogue often surprises radio producers (I’ve been writing for radio since broadcasting SAFE in 1991 as part of a young writers festival on radio 4). It’s faster than it appears on the page. Great! I get to write more. 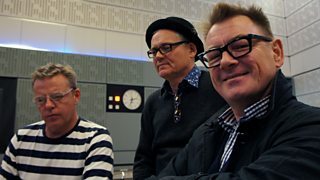 Last December, Suggs, Carl Smith and founder member of Madness, Mike Barson, bowled up at Broadcasting House. We recorded their scenes. And they were brilliant playing heightened versions of themselves. The play took over two years to develop and write. Last December, after the play was recorded, I went to Norton Folgate to visit my Turkish café. Or rather I didn’t. Sadly, it had closed. What’s that they say about life imitating..? in The Liberty of Norton Folgate! Mark Davies Markham writes for TV, theatre and radio. "Taboo", the West End musical he wrote for Boy George, was nominated for an Olivier Award . "Eric", his recent play for the Liverpool Everyman was also about the music industry.